Yes this is my Sunday breakfast. 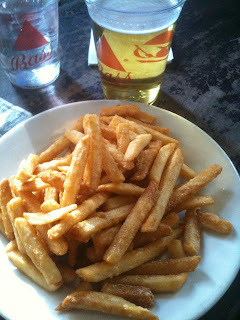 A pint of Bud Light and french fries. Why would someone start their day like this? Football. It's the only answer. After an extremely snowy and wonderful Saturday my friend and I woke up early and headed to McFadden's to watch our beloved team, the Buffalo Bills. We were in such a Buffalo state of mind what with the piles of snow everywhere and Christmas right around the corner. McFadden's runs an amazing awesome special during the Bills game- all you can drink Bud Light and all you can eat wings for $20. Pretty good deal right? Unfortunately we were to hungry to wait for the wing arrival so we ordered up some fries to start. The fries were surprisingly tasty. They had just the perfect amount of crunchy skin and salty innards. The Bud Light wasn't too bad either! McFadden's is by no means a destination food place but if your a Bills fan chances are you've been at least once in your lifetime. The Bills unfortunately lost but we had a great time regardless. It rounded out a wonderful weekend spent with good friends and family. Saturday we got to see my relatives from Tennessee and the blizzardy conditions just made everyone's day. I am so ready for the holiday season!